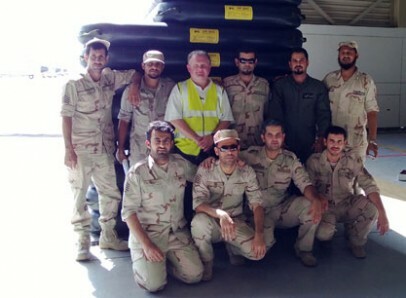 AMS have a global reputation for training recovery teams on the use of aircraft recovery equipment, so it came as no surprise when we were asked to provide on site training for the Royal Saudi Air Force. Aircraft recovery teams often face recovery situations that are very specific to their areas of operation, so the training needed to take into account dealing with desert conditions, including how equipment is affected by high temperatures and coping with high winds in open terrain. Fortunately AMS run regular training sessions with the USAF in Arizona and this experience proved ideal for dealing with the conditions encountered in Saudi Arabia, with the course tailored to the needs of the Royal Saudi team. At the end of the AMS course all of the team successfully passed and each member was presented with a Certificate of Proficiency. AMS also have a new, dedicated training facility in the UK and have already welcomed British Airways and Air New Zealand recovery teams. We can provide training for aircraft recovery teams at our UK facility or “on site” where required. To find out more please call us on +44 (0)1420 23777, or contact us using the form on our website.